Across America, churches are doing their best to express creativity when it comes to reaching new people for the purpose of presenting the Gospel. For the most part, the central message concerning the love of God and the deliverance that Jesus brings is preached in these churches, but that does not mean that every congregation looks or behaves in the same way. You may have a church on the east coast that looks more like a coffee shop, and when traveling to a rural part of Arkansas you may encounter a little white chapel far from the hustle and bustle of city life. There are large churches, and there are small churches. That is okay, because we are united in spirit, and have the common bond of Christ that connects us. From time to time, I have the privilege of visiting churches who are in need of help. In some cases, they have concerns regarding the direction the congregation is heading, and I arrive to help survey various members to try to assess the main detrimental issues that they face. I will never forget one particular church that I visited only a few hours away from where I live. On the outside looking in, they seemed to have everything going right for them. They had a young, energetic pastor. They had a relatively new and beautiful worship facility. They even had a good amount of young people in attendance. Everyone seemed fairly happy with the ministry that was happening, but I couldn’t help but think that there was something missing. Perhaps I was over analyzing what I felt, but I just knew that a heaviness existed that didn’t go away. One by one, church attenders filed into the interview room I occupied and I systematically questioned them to try to dig further. Each couple that came were in their late twenties and many others were in their early to mid-thirties. Toward the end of my time, I had two interviews that did not reflect the general lighthearted sentiment of the other people I interviewed. These conversations took place with people that fell into an older category. NOT OLD…mind you…but older (before you get upset). The first woman was in her eighties and the next couple were in their seventies. During the exchange, these individuals expressed concerns about the direction the church was heading. At first, to be honest, I assumed they were just being finicky and trying to cause division. As they spoke from their heart, though, they conveyed the same passion for the lost that everyone else did. By carefully listening with an open heart and mind, I realized that they were not being heard when it came to decisions in the church. Everything was changing and they didn’t necessarily mind change, but their minds were trying to understand the meaning and purpose behind some of the changes. Each change they described was geared to reach a younger generation. The leadership made it very clear that they wanted to specifically reach out to the 18-35 year olds in their community so they focused their resources and actions in that way. The pastor had gone to a leadership conference that taught him that this was the only way to grow the church. So, with passion and vigor, he came back ready to conquer that large suburb in the name of Jesus. As I reflected on this experience, my mind went back to all of the leadership conferences I have been to in the past. The takeaways that the pastor came back with are really ones that are conveyed at these events. Just so you know, I am about to say something that will be very unpopular. Folks. I think we are missing the mark. I think, when we focus on a certain age demographic, we are neglecting many others. We can change the paint color, music type, seating arrangement, and even the way we dress but, in many cases the tendency is to create a religion that is human focused instead of a movement that is Christ-centered. 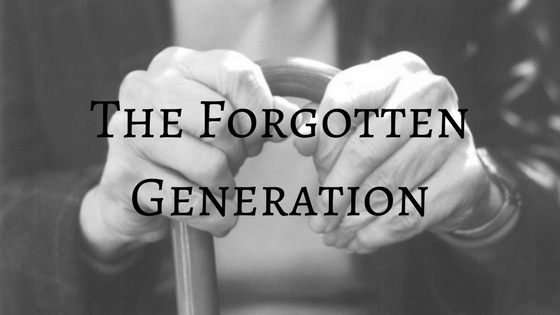 Specifically, when we neglect the older generation, we actually disregard the structure and content of scripture. In the Old Testament, the older generation proved to be the most vital generation and the vehicle by which traditions were passed to progeny. I have a theory that the older generation sitting in our pews is the one of the largest unchurched people groups we regularly come into contact with. That is, if we understand the term “unchurched” as “not belonging to or participating in a church”. We have thousands of older ladies and gentleman who come every service but do not feel like they belong, and do not get involved. We need to change this. If we are a Biblical movement, we cannot sit on the sidelines and neglect this forgotten generation. They have wisdom and so much to share. The only things that will radically grow our churches is a dedication to prayer, a passion for those who do not know Christ, and service to the “least of these”. Not a new gimmick or attaching to a cultural fad. Remember…there was never a story where Jesus did a demographic study before healing, preaching, or even dying on the cross. Love all. Serve all. Listen.